When we set about designing the SteadyPay repayments feature, we wanted to take a different tack to other lenders. For one thing, we don’t charge any interest on the top-ups we advance to you. But it’s also a matter of structuring the repayment so you retain the cash to meet other commitments. To limit the repayment to the amount of pay that’s above average. This in turn gave us insight into how repayments could be made. If your balance (the amount that needs to be repaid) is smaller than the amount of pay that’s above average, a full repayment should be made. This is illustrated below in Example 1. If your balance is bigger than the amount of pay that’s above average, partial repayments can be made. Whatever’s left of your balance can be rolled over to the next pay, up to three times. This is illustrated below in Example 2. If you receive average pay or no more than £24.99 above average pay, the repayment is optional. Provided you can manage it, constantly paying down debt is good practice. This also helps to reduce the repayment load on an above average pay. You can of course make an extra repayment at any time. Repayments are managed from the SteadyPay app. You’ll receive notifications when a repayment is due and on the repayment options. There is an implication to our design: we need to monitor for any drastic drop to your average pay. Repayments in this context could place you in financial difficulty. When this happens, we adjust the repayments so that you have the means to pay off priority debts (such as rent and power). We also contact you to confirm that you can afford the adjusted repayments. 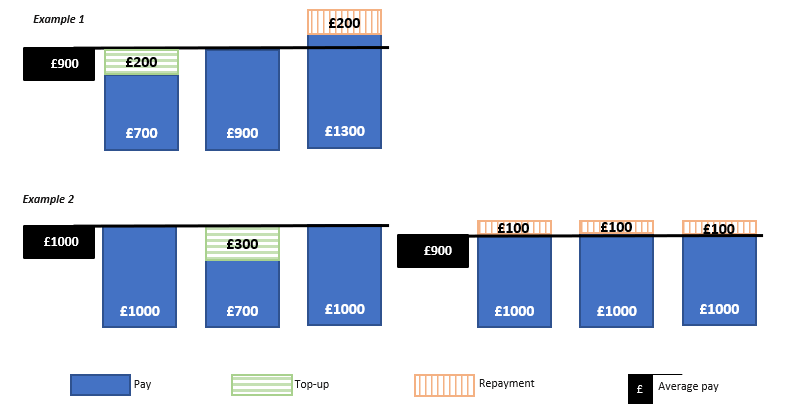 Designing a repayment feature isn’t easy! We think we’ve come up with something cool, but we’re always looking ways to improve. Please send your feedback to [email protected].